A few years ago, Paul Jaminet's book, Perfect Health Diet: Regain Health and Lose Weight by Eating the Way You Were Meant to Eat (and his blog of the same name) introduced the concept of "safe starch" to the Paleosphere and immediately objections, concerns, and outright disdain rang out from all sides. The low-carb camp was taken aback for obvious reasons (starch = sugar) and, if you recall, in Loren Cordain's "The Paleo Diet" and Robb Wolf's "The Paleo Solution" potatoes, white rice, and starchy foods in general were verboten. 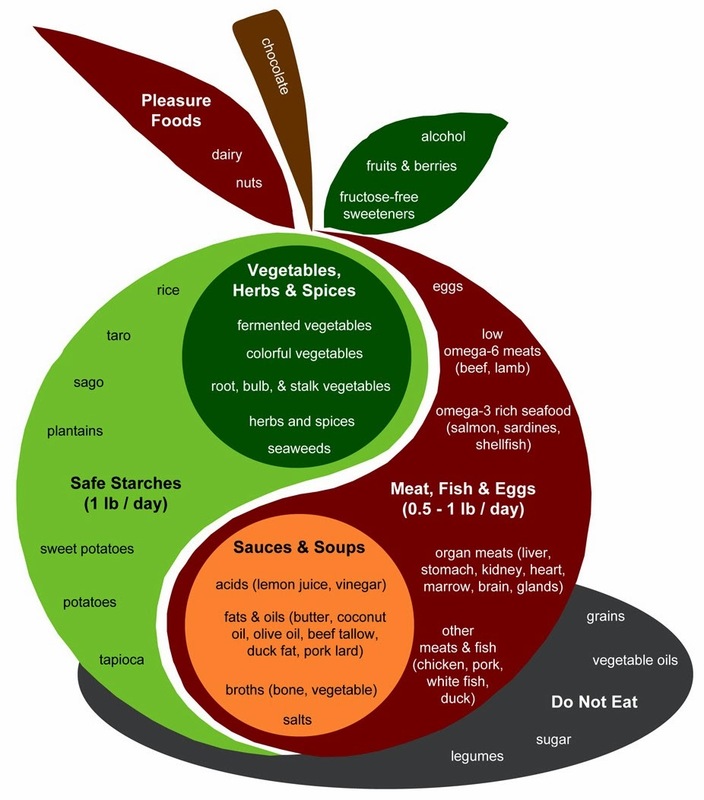 The reasons for excluding white rice, potatoes, and other starches included their perceived low nutrient density, blood sugar spiking potential (a special concern for those suffering from diseases of blood sugar dysregulation such as diabetes), and anti-nutrient content (the mineral binding or "chelating" anti-nutrient phytic acid given particular attention). But despite this, Paul Jaminet recommends "About 1 pound [0.45 kg] of safe starches, such as white rice, potatoes, sweet potatoes, and taro." Why might this be so? "Carbon comes in heavy (carbon-13) and light (carbon-12) forms, and grasses and sedges ("C4 plants") incorporate relatively more carbon-13 than other plants. So the carbon-13 to carbon-12 ratio in a skeleton tells us what fraction of the creature's food was obtained from grassland plants or animals that ate grassland plants. There is considerable variability, but in general grassland plants predominated in the diet of Paleolithic and earlier hominids. This created a puzzle, known as the "C4 conundrum." Hominids such as Australopithecus africanus and Paranthropus robustus did not have the right kind of teeth for eating grasses and were not thought to be major hunters of grazing animals, yet their bones show that they got their carbon from grasses. The resolution of the puzzle: those apes were getting their dietary carbon from C4 plant underground storage organs - tubers and corms similar to the modern potato and taro." A Note from Paul: A purist might quibble that Australopithecus and Paranthropus were not “Paleolithic humans”, but pre-Paleolithic pre-humans; the response is that other evidence like dental plaque shows that Neanderthals and Upper Paleolithic humans ate starches also, and so there’s every reason to think starch was continually present in the Paleolithic diet from 3.5-4 mn years ago to present, indeed as long as humans were bipedal (which means they were occupying non-forest areas where starchy tubers not fruits would be the primary plant foods. "A fasting person's daily glucose production has been measured at 8 micromoles per kilogram per minute, which for typical adults equals 120 to 160 grams, or 480 to 640 calories, per day. If most of the body's optimal glucose needs are met during fasting, we can estimate the natural carb intake at about 160 grams, or 640 calories, per day. We can get to a similar number by adding up the body's specific uses of glucose." "Although the precise magnitude of the various quantities is uncertain, it appears taht the body's natural daily glucose consumption is about 480 calories for brain and nerves (decreasing to as little as 150 calories if ketones are available), 200 calories for glycoproteins such as hyaluronan and mucin, 100 calories for muscle glycogen and immune, intestinal, and kidney cell use, offset by about 200 calories of glucose produced in the course of fat burning. For sedentary healthy people, then, the natural carb intake is about 600 carb calories per day. Ketogenic dieting can decrease glucose needs by up to 300 calories. Athletic activity increases glucose needs by up to 500 calories per hour of training. Illness or wound healing may also increase glucose needs. "Starchy foods, attractive to insects and herbivores due to their calorie content, often generate toxins. However, some - the ones we call "safe starches' - become nearly toxin-free with proper preparation. Our safe starches include taro, white rice, sweet potatoes, yams, well-handled potatoes, sago, and tapioca. Safe starches are a nutritious and important part of the Perfect Health diet. they provide glucose without fructose; resistant starch, which imporves gut health; and useful minerals such as potassium. We recommend avoiding brown rice because of phytin, mentioned above, and because rice protein - found primarily in the bran - has been found to provoke an immune response, implying toxicity. No antibodies to rice proteins have ever been identified, however, so it appears that rice toxicity cannot progress to severe disease in the way wheat toxicity can. Other plants can be kept safe with improper handling. Potato toxins solanine and chaconine are generated under exposure to heat and light. At low doses, these toxins are efficiently cleared from the body. thus, potatoes kept continuously in cool dark conditions are safe. discolored potatoes should be discarded." Consuming ~30% of your daily caloric needs from carbohydrates (sourced primarily from "safe starches") is not only "Paleo", but perfectly healthful. Fill a large pot with cold water. Add 2 tsp sea salt to the water and bring to a boil. Add the pasta to the water and, stirring occasionally, allow it to cook for 15 minutes. While the pasta is cooking, heat the avocado oil in a sauce pan over medium heat. Add the garlic and saute for one minute, stirring continuously to prevent it from burning. Add the ground beef and cook until thoroughly browned. Add the pasta sauce and bring to a low simmer. Cover until ready to serve. When the pasta is done, pour it into a colander in the sink, being careful to avoid being splashed by the hot water, and immediately rinse the pasta with cold water. Rinsing white rice pasta is an essential step to keep it from sticking together, so be thorough and ensure that all the strands are rinsed. To serve, plate a small portion of the pasta and top with sauce.